Here is an interesting tableau of pears that I found while taking my morning walk. 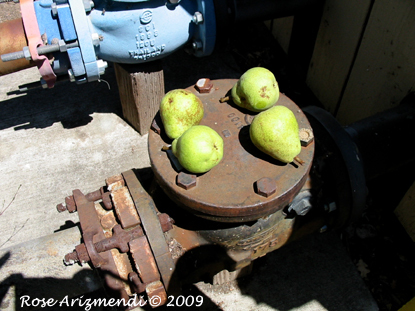 It felt like I had somehow stumbled upon a secret hiding place where someone had placed four pears to ripen. There they were waiting for the return of whomever put them there for safe keeping. A pair of worker’s gloves resting on the ground nearby and the quiet solitude of the place made me feel like an intruder of sorts. I quickly snapped a couple of pictures and moved on. I looked around but didn’t see anyone, and I wondered about the story behind the pears and the mystery person who placed them there.